“The Promise of Poetry” project is a knowledge building initiative that focuses on volumes and anthologies of African American poetry published since 2000. The project seeks to increase participation in the appreciation of literary art through a series of “browsing sessions” and blog posts and by encouraging groups of people at the university to exchange ideas about poetry. 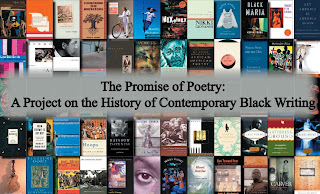 Overall, “The Promise of Poetry” project addresses the paucity of commentary on contemporary verse and at the same time extends the Project on the History of Black Writing's goals of implementing public literacy activities that focus on African American literary art.